Blue Diamond Window Cleaning has been providing top quality services for over 30 years. Our attention to detail and our commitment to getting the job done right is what makes our company different from the rest. All of our work is guaranteed. 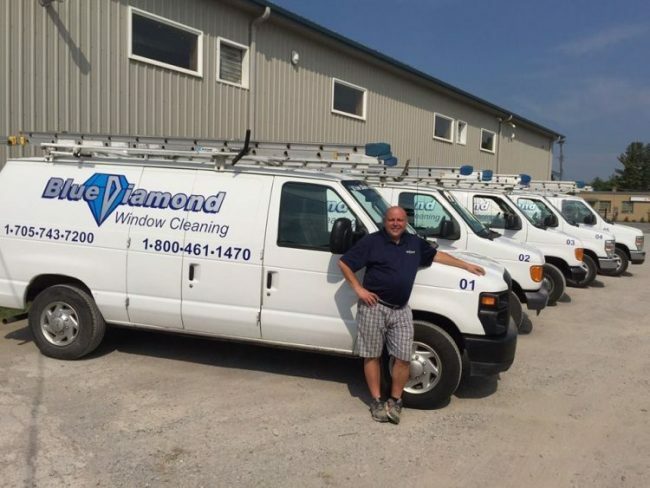 At Blue Diamond we use a unique system to clean windows. Each of our vans are equipped with a filtration unit that removes minerals and other organic material that would cause the windows to streak. We brush the windows with special soft bristled brushes that remove dirt without scratching the glass. Then we spray the windows with super clean water so they dry spot free. Blue Diamond services all of the Kawartha’s, as well as Durham Region, and Victoria County. We also clean interior windows, eaves troughs & siding. If you would like more information or have any questions, please call today for a free quote.